Ron was born in Fort Collins, Colorado and raised in Boulder. He lives in Fort Collins. He was always interested in art and drew animated flip books as a child. He took art classes in school, but decided to become a scientist. During his career as a biologist, Ron traveled to many beautiful locations, taking many photographs and continued drawing and painting watercolors. He retired in 2010 and continued his art hobby with more local art courses and painted many watercolors. Ron became interested in oil painting after his mother-in-law passed away in 2014 and left behind her oil painting supplies. He continued to develop his painting skills and shows his art at local art shows. He has won several awards for his oil paintings at the 2016 and 2017 Fort Collins Senior Center Arts and Crafts Show and the 2018 Larimer County Fair. He has shown his work at juried shows at 3Square Art Gallery in Fort Collins and Gallery 1505 in Denver, the 2017 Chasing Light Invitational art show at the Carnegie Center in Fort Collins, and has donated art pieces to silent auctions. 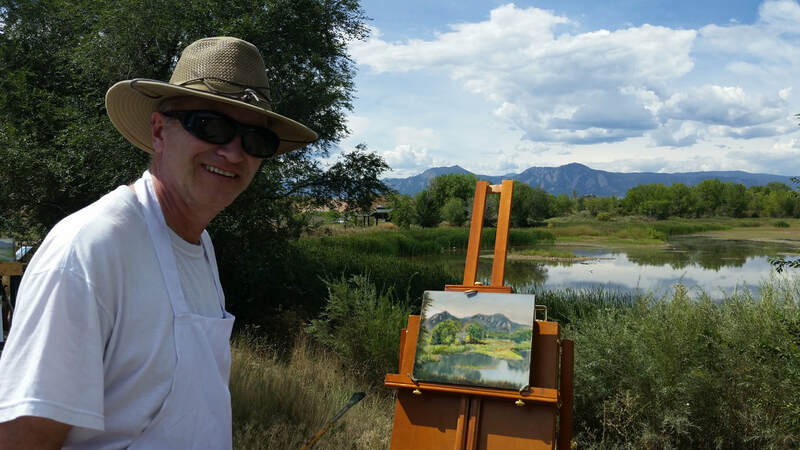 Ron tries to challenge himself with each new painting, using a variety of techniques, including plein air. His primary mediums are watercolors and oils, with some acrylic. His main subjects are landscapes and living creatures. Ron paints to nourish his soul and express his imagination. He wants people to feel the beauty he sees everywhere. He has yet to paint the perfect masterpiece and is his own worst critic as he sees flaws in every painting the day after he thinks he painted the world's best painting. However, he appreciates the joy and serenity of painting and with the support of his wonderful family, he continues the journey.